Pastor to the McGlothen Temple Church of God in Christ for 23 years, from 1941 - 1964. 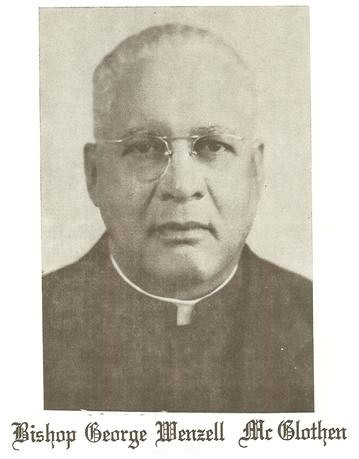 Bishop George Wenzell McGlothen, known more affectionately as "Dad" was saved and filled with the Holy Ghost in 1922. That same year he married Mother Mattie McGlothen, more affectionately known as "Mom". His first pastorage was in Batesville, Oklahoma with a congregation of less than ten people. The late Bishop Page transferred him to Hugo, Oklahoma, to pastor a small group of saints. There he was successful in renovating a church. He traveled many different places before coming to California in 1934. The late Bishop S.M. Crouch appointed him as pastor of a church in Fresno. In 1941 he was appointed pastor of the Church of God in Christ in Richmond. The church was worshipping in a small building now known as the church-dining hall. With Spiritual guidance, aid of the Deacon staff and members of the church, Dad worked diligently on many fund raising projects during 1944 and 1945. In 1945 Bishop McGlothen and the officials of the church began to lay plans for the building of this present edifice at a cost of $50,000. The construction of the new edifice began in October 1945 and was completed in March 1946. Under Bishop McGlothen's wise council and leadership the construction was paid for in full. Dad McGlothen served as Jurisdictional Bishop for Montana and Eastern Nebraska. He was the founder of the Richmond District. He was very active in the community. His leadership qualities extended into various civic activities. He served as advisor at the Wells Fargo Bank, helping people who needed financial guidance. He also served as Chairman of the Redevelopment Agency in the City of Richmond, especially in Parchester Village where there is a street named in his honor. All of the streets of Parchester Village are named after local Black Pastors. Dad was very instrumental in local church choirs being able to sing in the State Convocation on Sunday Morning. He wanted his choir to sing, so they did. He was very proud of his members and he always pushed them to the forefront. When ever there was a State Meeting at McGlothen Temple, his Ushers were the only Ushers the floor. McGlothen Temple came into its' "Glory" under the pastorage of Bishop McGlothen. There were witnesses of great healing, even the blind receiving their sight. Bishop McGlothen was a great administrator. McGlothen Temple has always been known for its' "Strong" Board of Deacons. He believed in training them. It has been said that McGlothen Temple has had the "Best and Strongest" Board of Deacons in the Church of God in Christ. Bishop McGlothen "Dad" will always be remembered!